Mistress of the Stash is having a contest – leave a comment (by 12:00 pm CDT on May 2) about your favorite colorway and you could win a skein of sportweight Claudia’s Handpaint. Carrie is having a contest to celebrate spring and starting new things. To participate, cast on a crazy new dishcloth and send her a picture by May 5 – you could win a skein of Austermann Step sock yarn. I don’t know if you’re following the pet food recall, but contaminants now have been found in not only wheat gluten, but also rice protein and corn gluten. Over 889 pet food items under 100 brand names have been recalled. Some of the recalled pet food may have been fed to hogs destined for human consumption. Pet Connection and Pet Food Tracker seem to be doing a good job covering all of this. You will get to see other pictures of the dress! It’s blocking even as I type – hopefully it will be dry by tonight. Nope, he doesn’t look happier to me, either. Posted by Chris on Thursday, April 26th, 2007, at 7:06 am, and filed under Contests, Randonymity. Oooo, lovely eyes Chaos, it does compliment you! That’s so funny, Gandalf was doing the same thing this morning under my covers! Thanks for all the info on the pet food recall. The Little Dudes are inching closer to getting homemade stuff. And soon after they’ll be lounging in tie-dyed kitty beds and doing yoga. Chris- Poor guy- though I will say the green does bring out his eyes. In “And Now for Something Completely Different” they do a sketch “How Not to be Seen”. You should show that to Chaos. Poor kitties! They’re too traumatized. It’s Chaos’ new “Stop the madness” look. And I an sure that May started it. Her designer taste decided that green would be just the thing. That crabby look? All her feline models will have it–it’s part of the theme of her spring show. Heh, it does bring out his eyes! But no, not a speck less crabby. It’s so tough being Chaos. I’m so upset about the Pet Food fiasco. This is the problem when a very few corporations make all the food. ARGH!!! 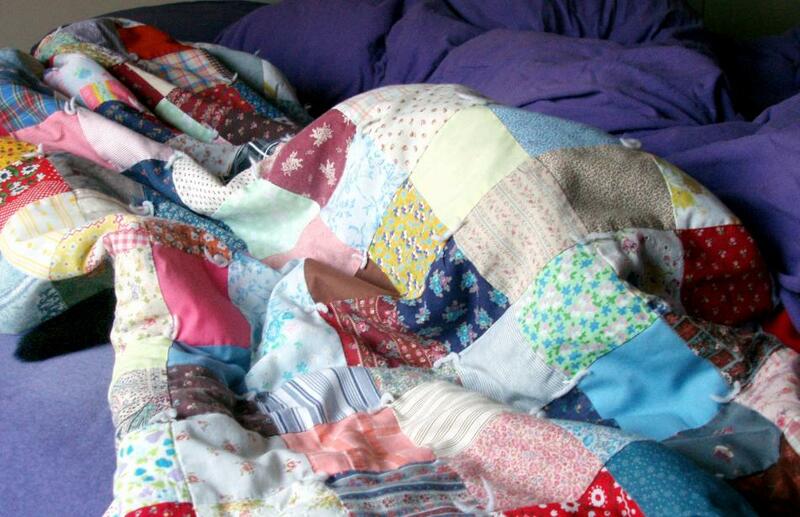 On a completely different note…I love the quilt the kitties are being invisible under…. Thanks for the Pet Food links – Kona had me a little worried this week, but neither of my fur kids’ food were on the list. This pet food thing is really, really scary. I’m putting the Minneapolis phone number of the ASPCA on my speed dial if this doesn’t stop!!! 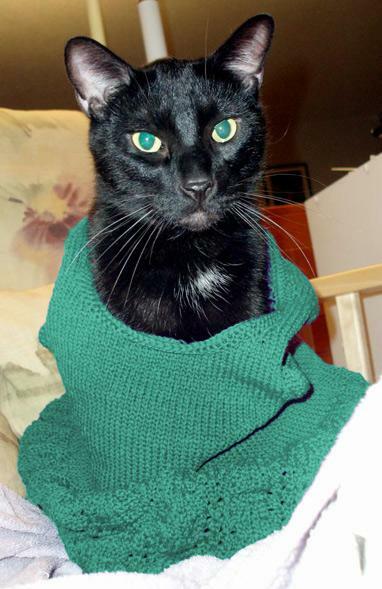 Cat dresses are about as good of an idea as a fur sink…can you knit one of those? Holy crap — so what exactly are you feeing your cats nowadays?! He may not look any happier, but at least he’s accessorized properly for the dress! Go fashion cat guru, Chaos!! OH…MORE kitties who think they’re invisible under blankets! The Meezer loves this herself. The pet food recall is insane. Makes me sick. Thanks for the current links. Those poor kitties, the abuse they suffer at the hands of their own mother…..makes for great blog fodder don’t it! Thanks so much for the pet food links. I checked the big bag I bought last night and sure enough, it was recalled last month! I’m taking it back to Safeway! This whole pet food thing is just nuts. Fortunately nothing we’re feeding ours is on the hit list, at least not yet. Poor Chaos. 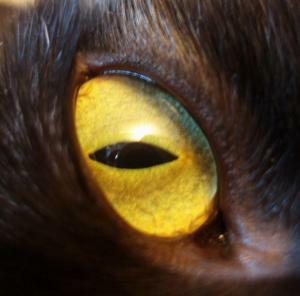 If that cat coughs up a hairball on your pillow in revenge, it will be your own fault. LOL Yup he still looks like he’s gonna use the couch as a scratching post or something else devious. Wow. Green looks good on Chaos. Something tells me it will be a long time before we see more than a cat tail from Chaos and May. 🙂 The green just seems to bring out the daggers in his eyes. The ferrets are starting to demand to go on the all Gerber baby food meat diet (aka “crack for ferrets”). OMG, the expression on Chaos’ face is priceless!!! LOL And May’s face says it all, you have reached a new low!!! ROTFL!!! Nobody ever said your kitties were slow…they know to hide after having to pose in a dress! hello from singapore! Where it gets Hot Hotter and more Humid than I ever imagined. It is really nice and the people are great. The pictures of May are adorable, see you soon. Great job by KitKat with the colour change 🙂 I’m sure Mayhem would be distressed to know that cat-shaped lumps in the bed are very easy to detect! Thank you for posting about the cat food. Thankfully we feed Smitty, Smoosh, Trina and Milo IAMS dry food, which isn’t on the list. When we feed wet food, it is usually a can of tuna fish (our tuna fish!) which they love. Haha. How cute. Like your quilt! Thx for the pet food detail–I’d stopped paying attention since our cat food doesn’t contain wheat gluten. This is frightening. It reminds me a bit of Robin Cook’s novel about the e-coli (I had e-coli problem in MN–or one similar–I ended up in the hospital with depleting red blood cells, which they had to monitor for about a year).